Note: Not all users can export/download data. 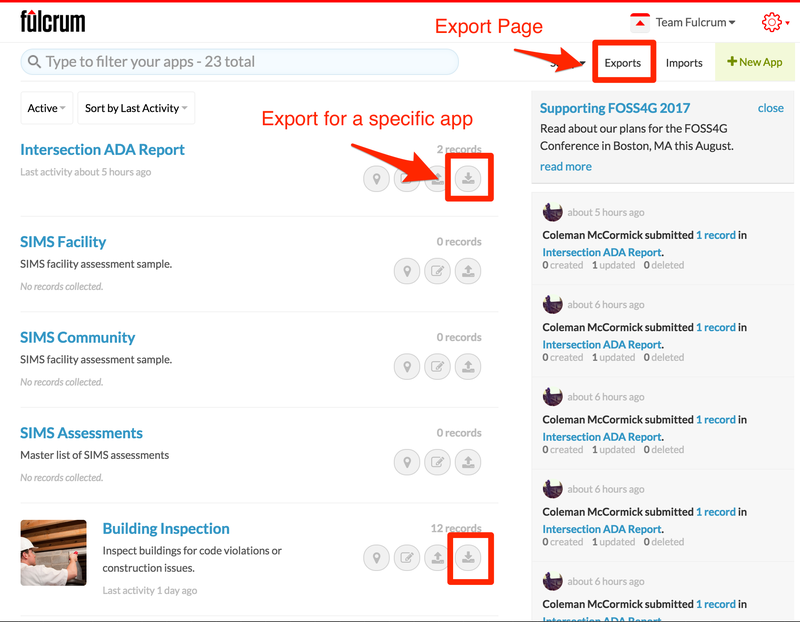 The ability to export data depends on the system role or the custom role that your user account has in your Fulcrum plan. There are two main export/download options. From your apps’ dashboard view. The main exporter has some additional customizable settings that the record editor data downloader does not currently have. Like exporting full history, including the Raw GPS data, and the ability to export the photos. The other way of obtaining your data is from within the data editor for a specific app. This option will provide you with an export file that contains just the filtered data. So if you are looking to not include certain columns or wish to filter what records are included, then you will want to use this export option. When using split or map views, the downloaded export file will also be filtered to only contain the records that are displayed in the visible map area. The total number of records that will be contained in the downloaded file is displayed to the right of the column setup icon above the table/map area. In both options, the data can be exported from your account in any of several formats, (such as CSV, Excel, KML, Shapefile, and GeoJSON).